Three tanks are connected with two pipes. Each tank is initially filled to a different level. A valve in each pipe opens, and the liquid levels gradually reach equilibrium. Here, we model the system in MapleSim (including the influence of flow inertia), and also derive and solve the analytical equations in Maple. 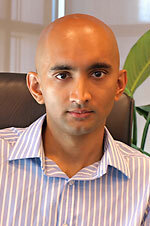 Liquid inertia is significant for high liquid densities, high flowrates, and large pipe diameters. This will affect the flow dynamics in the coupled tank system, and can result in oscillating flow as liquid sloshes back and forth between the tanks. Section 2 demonstrates the modelling approach in MapleSim, while Section 3 derives the analytical system equations. Section 4 offers download links for a Maple worksheet (which solves the analytical equations) and a MapleSim model of the system. MapleSim’s Circular Pipe simulates frictional pressure drop with Darcy’s equation, but only applies to equilibrium flow. Flow inertia results in an additional pressure drop. Consider one of the connecting pipes. The net force ΔF acting on the liquid in the pipe is given by Newton’s Second Law. These additional relationships also apply. ΔP is the pressure drop across the pipe, A and L are the cross-sectional area and length of the pipe, ρ is the liquid density, and Q is the volumetric flowrate. Substituting equations 2.2, 2.3 and 2.4 into 2.1 gives the following equation for the pressure drop across the pipe due to fluid inertia. This is the equation used in MapleSim’s Fluid Inertia block. This block will be used to model the inertial effects of flow in the coupled tank system. A pipeline with resistive and inertial properties can be modelled by connecting the Circular Pipe and Fluid Inertia components together, as demonstrated in Figure 3. The total pressure drop is hence the sum of the frictional pressure drop and inertial pressure drop. where g is the gravitational constant. Figure 4 demonstrates how equations 2.6 and 2.7 are implemented in a Custom Component. The simple tank equations allow the liquid height to fall below 0 or rise indefinitely. A more complex model would limit the minimum and maximum liquid heights. This is the completed tank component in MapleSim. The top connector outputs the liquid height as a signal. The connector on the bottom right is a hydraulic connector, and has pressure and flowrate mapped to it. The entire model can now be assembled in MapleSim like so. where P1(t) and P2 (t) are the pressures at the bottom of tanks 1 and 2, V12(t) is the liquid velocity, f is the friction factor, ρ is the liquid density, Lp is the length of the pipe, and Dp is the pipe diameter. The term associated with f is the pressure loss due to friction. 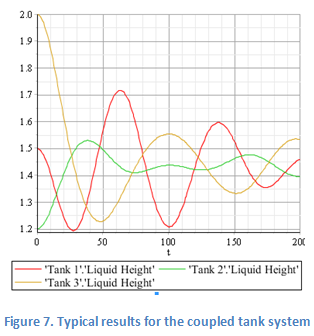 A similar analysis gives the following equation for the flow between tanks 2 and 3.
where the cross-sectional area of each tank is A1­, A2 and A3, and the liquid height in each tank is h1(t), h2(t) and h3(t). Given a suitable set of initial conditions and parameter values, equations 3.13, 3.14, 3.15, 3.16 and 3.17 can be solved with Maple. A correlation for f is needed; MapleSim uses the Haaland correlation. 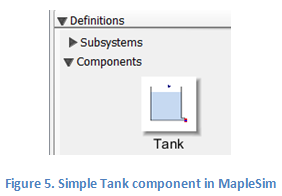 Here are download links for a Maple worksheet and MapleSim model of the coupled tank system, each with the same parameters values. Both approaches give the same results.